Mom, the Intern: Mom's Cancer Chronicles: How's your mom? Mom's Cancer Chronicles: How's your mom? After hearing this question numerous times over the past month, the thought occurred to me that I haven't updated my blog about this in a while, and maybe that would be the best way to thoroughly answer the question of "How's your mom doing?" So, for all who would like to know, here's my answer. First off, my mom's cancer experience is not like most of the ones you see portrayed in movies and on television. She's not bald or bedridden, she's not having chemotherapy, radiation or surgery at the moment, and you can't tell she has cancer just by looking at her -- she appears to be her bubbly, beautiful, youthful self. As she explains on her blog, she is not suffering through the more painful and difficult side effects of cancer treatment people usually think of. No debilitating nausea and vomiting, no hand-and-foot syndrome and she's still able to go to her home-away-from-home Costco on a frequent basis. But I don't want to give a partial answer, either. Regardless of her appearance and Costco attendance statistics, Mom still has Stage IV breast cancer. It is not curable and will never go into remission. She constantly has to deal with the emotional stress of this diagnosis along with the physical pain. In conjunction with her two cancer treatments -- a daily estrogen-inhibitor pill and an IV bone loss prevention drug she receives once a month -- she takes an anti-anxiety medication just so she can sleep at night. This truly breaks my heart. But ... it's still pretty bad. The bone drug, Zometa, is intense. She received her first round at the end of February. It gave her severe joint pain and made her feel like she had the worst flu ever, and the side effects lasted a few weeks. This drug also carries a risk of increased bone fractures, which she could sustain even from doing NOTHING. She will have to take this for the rest of her life. The estrogen-inhibitor, Arimidex, gives her hot flashes and makes her feel like she's going through menopause all over again. She suffers with constant back pain caused by the medication as well. And yes, she will also have to take this drug for the rest of her life. In a few months, she'll be rescanned to see how the cancer is responding. Remember, the cancer won't ever go away, but its progression can be stopped with these medications. So that is our prayer, that is what we are fasting and hoping for daily. So ... that is the most current answer to "How's your mom doing?" But be aware that it changes from day to day. It's complicated, dealing with cancer. It's a roller coaster of tests, diagnoses, medications, appointments and side effects. It's not simply "good" or "bad." It's a myriad of ever-changing emotions, experiences and challenges. Now to address "the question" in question (haha). When asked face-to-face how my mom is doing, the answer I give depends on how much time I have as well as how attentive I perceive the person asking the question to be. As you now know, it's a long and complicated answer, and you honestly may not have the time to hear the whole thing. You may be in the middle of dealing with your children or on your way to a meeting or doing some other preoccupying activity, and that's OK -- I appreciate that you thought to ask. It shows you care and it's a meaningful gesture. But I want to do the response justice. I want to answer as thoroughly as I can, because this is a really big deal and I don't want to treat it lightly. Plus, it helps me process what I am going through to tell and retell the ins and outs of my mother's cancer experience. It becomes exhausting to think about my mom's illness day in, day out. Emotionally, I have to prepare myself for these kinds of questions. Every time I am asked, it takes me back to how I felt when I first learned my mom has cancer -- that gloom-and-doom, insecure pit in my stomach reappears. At least I am putting my journalism degree to good use, having to consciously disconnect emotionally to disseminate the facts to people without bawling in their faces. So, I guess what I'm saying is, feel free to ask me how my mom is doing, but please know this question is not in the same vein as, "How was your dinner at The Olive Garden?" I ask that you please don't use it as some kind of cheap ice-breaker or conversation-filler. Please, don't ask unless you're prepared for a few minutes of uninterrupted conversation about it. Because if one of us is wrestling our kids or I'm passing you in the hallway at church, you're going to get the quick, basic answer of "She's fine; thanks for asking." Which is to say, "She still alive and well enough to go to Costco ... but there's so much more!" And I don't want anyone to get the wrong idea about my mom and what she's going through. She might be "fine" by all appearances, but she is going through a huge trial nonetheless. And as I said before, it's a rather immense question. It's easier for me to respond to things like, "What kind of treatment is your mom having right now?" "What are her side effects like?" "What is the puppy up to these days?" It's not as overwhelming. I can handle small questions. If you want to call me up or text me or even chat in person about it, I'm totally down with that, too. And also, if you want to show you care but don't have time for a lengthy conversation, you could always just say something like, "I've been thinking about your mom." Then, I can reply with a very sincere, "Thank you so much," and we can move on from there. On that note, I do want to thank all of you who have left supportive comments, engaged in conversation about this and have done nice things for me since Mom's diagnosis. A few people brought me dinner and treats, offered to watch my kids, sent me really nice texts and have generally been very uplifting. It really does brighten my days and gives me a little hope when I'm feeling down about it. I am so, so grateful for all of it. Let's end on a happy note -- yesterday, I took Audrey (on Spring Break) and baby Clara to visit my parents and sisters. The puppy, Daisy, is getting huge! She is so cute, though, like a fluffilicious teddy bear. 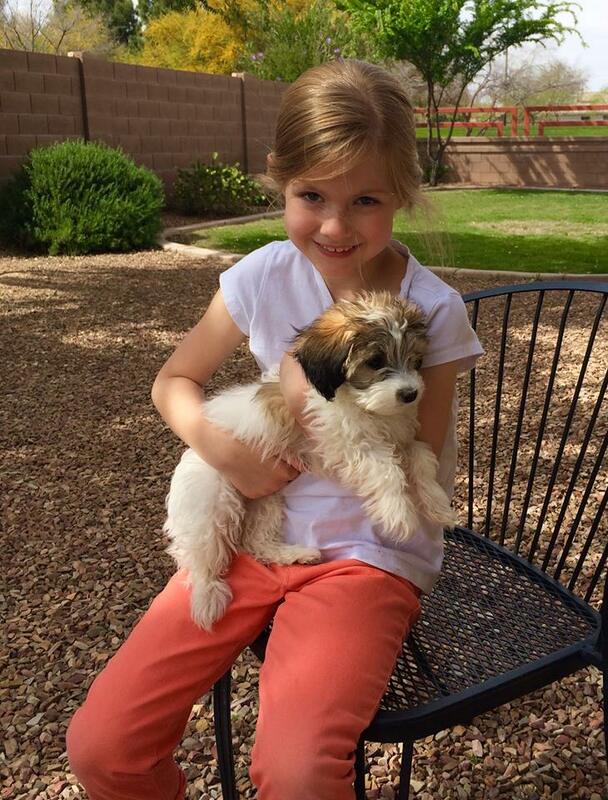 Here is a picture of Audrey holding her. She really loved having some one-on-one time with Daisy. My dad was on that bone drug. It was awful. We really feared that he would break something. Having a parent with cancer is tough. Prayers for you and your family. Fluffilicious. I like that word.